How do you say goodbye to a valued colleague with whom you have worked closely for almost two decades? Maybe there is a farewell party, a collection for a gift, a bunch of flowers? If the colleague is moving to an exciting new post, the affair is usually joyful, possibly tinged with envy as well as regret. The same is true if the colleague is retiring – depending how close you are to retirement yourself. But what are those who worked on developing the comet lander Philae supposed to feel now their colleague faces “eternal hibernation” after a decision was made to give up trying to contact it? The Rosetta spacecraft released Philae onto comet 67P/Churyumov Gerasimenko on November 12 2014. Although the landing didn’t go quite as planned, Philae was still able to operate for almost 70 hours before its main batteries ran out, fulfilling almost all of its scientific goals. The awkward landing prevented Philae’s solar panels from charging-up the secondary batteries, but it was hoped that as 67P drew closer to the sun, the increasing levels of light would revive the sleeping lander. And this happened – on June 13 2015, Rosetta received a signal from Philae, indicating that the batteries were charged, and the lander was all set for another phase of investigation. Unfortunately, in order for Philae to work effectively, there had to be a stable connection with Rosetta. And that did not happen, possibly because Philae’s transmitter became damaged as it landed. Only intermittent communication was possible – and then even that ceased when Rosetta had to move away from 67P as it came closer to the sun. This was because the amount of dust flowing away from the nucleus was a danger to Rosetta. Imagine having to steer a vehicle through a howling blizzard with no way of clearing the windscreen – that was the effect the dust was having. 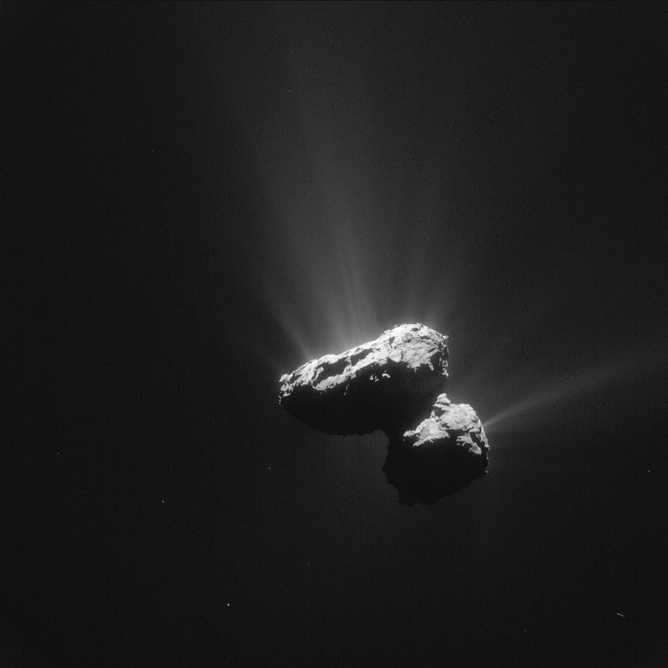 The spacecraft had to retreat to a safe distance of about 300km from the surface – too great to hear Philae’s signals. There was a second opportunity for communication when Rosetta went through its closest approach to the sun and then started to move away, and the comet’s activity decreased. Rosetta has been listening for Philae, but sadly not a chirp or a tweet has been heard. Partly this has been because the distance between Rosetta and the nucleus was too great – but since about January, Rosetta has been within hailing distance, and still no word has been received. We are not certain why Philae has not been able to communicate. As well as potential damage to its transmitter, the communications antenna might have been displaced and could be pointing in the wrong direction. Or the copious quantities of dust released by the comet have covered the solar panels, preventing them charging up. Or some of the dust has found its way into the inner workings of the lander, and jammed an essential component. Or ice could have sublimated – vaporising without turning into a liquid first – below the lander, causing it to fall even further over. Yet other possible causes are an overhanging ice cliff crashing down on top of Philae or too much sunlight frying the electronics. Unfortunately, because nothing much can (or could) be done to fix the communication problem, it doesn’t really matter what is causing the radio silence. It is disappointing that there was no opportunity for additional science from the lander – but so much information was returned from the initial campaign that the Philae scientists will be kept busy for plenty of time yet. And never say never. Over the next six months, Rosetta will orbit the comet more closely – and by about August could be in a position to see Philae directly. If this happens, we should be able to deduce why communication couldn’t be established. It will also help us interpret the data acquired by the instruments, as we will be able to see the landscape in which Philae is sitting. There will not be any retirement parties for Philae yet – not until Rosetta makes its controlled landing on 67P in September. And that will be a glorious ending to an unforgettable mission.